On the ice, Kaetlyn is full focus – nailing her jumps and gliding effortless from one end of the rink to the other. Her daily routine consists of ballet practice in the morning and training at the rink for hours in the afternoon. And with hard work comes great success – like being a three-time Olympic medalist and 2018 World Figure Skating Champion. It’s at home where Kaetlyn can finally relax. Good thing Rasquette, her Cockapoo, and Annie, a ragdoll, are right by her side for some rest. Though, a puppy always needs a fair amount of play – so a walk around the neighborhood or a game of fetch is always on the agenda. Rasquette even gets to visit Kaetlyn at the rink on occasion – to root on her mom but mostly to score some major snuggles and pats from the young, aspiring ice skaters at the training rink. Living Healthier Together™ includes resting up and focusing on your mental health, especially when you’re training for one of the biggest competitions of your life. Thankfully, Rasquette and Annie are experts in cuddling – fueled by Nulo. 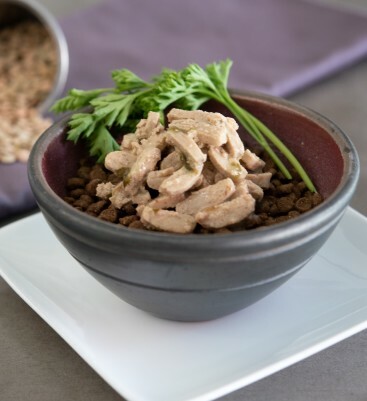 Which Mix-it Meal is right for your pet? Miscanthus grass reduces the likelihood of hairballs.